On 5 February 1999,while conducting exercises off Hampton Roads, VA, the USS Arthur W. Radford was involved in a collision at sea with a Saudi Arabian container vessel. The Saudi vessel 's stem and bulbous bow penetrated the starboard side of the Radford, centered near frame 69 (approximately at the location of the forward 5"gun mount). 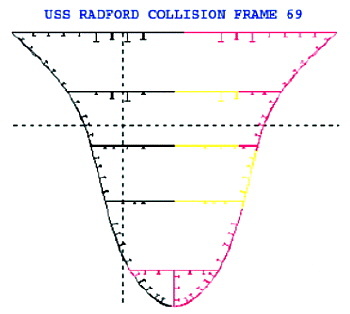 As a result of the collision, the Radford experienced significant structural damage and flooding from frames 58 through 94,with additional flooding within sonar equipment spaces between frames 29 and 58. Post damage inspections indicated that flooding was complete (free-flooded to the waterline). Structural damage from the stem of the Saudi vessel consisted of complete penetration of the side shell and main deck from the 1st platform deck (24'above baseline) on the side shell to the ship 's centerline on the strength (01) deck, with damage extending mainly from frames 52 through 84. Additional structural damage below the waterline from the bulbous bow of the Saudi vessel consisted of complete penetration of the side and bottom shell from the 2nd platform deck (15'above baseline) to the center vertical keel at the baseline, with damage extending mainly from frames 64 through 82.Outside these primary penetration areas, there was significant buckling of decks and tripping of stiffeners caused by the transverse force of the collision. Thus, many of the structural members outside the primary penetration area provided reduced effective strength to the hull girder. Norfolk Naval Shipyard was tasked with stabilizing the vessel and drydocking for initial assessment and planning for eventual repair/replacement of the bow of the ship. Initial assessment of the collision damage to the ship was provided utilizing POSSE. Additionally, POSSE was utilized to provide assistance in the development of a weight removal and deballasting plan for preparing the ship for drydocking on 25 February. POSSE was also utilized to provide an evaluation of the drydock block bearing loads and ship's structural strength during and following the drydocking process. Finally, POSSE was utilized to provide an initial assessment of stability and structural strength of a potential (proposed) refloating of the ship with the bow section removed (forward of frame 94). The ship was drydocked at Norfolk Naval Shipyard Drydock #3 on 25 February. The ship 's initial (undamaged) condition was developed utilizing an existing SUPSALV electronic POSSE model for the DD 963 class (with VLS). This electronic POSSE model included full entry of hull and all compartment offsets into the 3-dimensional electronic model, in addition to representation of a number of ship structural sections for longitudinal strength calculations. Lightship weights (weights, centers, and longitudinal weight distribution) were based on class data and modified to match DD 968.The initial (intact) load case was developed based upon detailed weight logs provided by Norfolk Naval Shipyard, matched to the ship's underway drafts. As a result of the collision, the Radford experienced significant structural damage and flooding from frames 58 through 94, with additional flooding within sonar equipment spaces between frames 29 and 58. Post-damage inspections indicated that flooding was complete (free-flooded to the waterline). POSSE was used to calculate trim, stability, and residual strength of the Radford in the afloat damaged condition. Damaged drafts were calculated to be 26.4' forward and 20.0'aft (trim of 6.39' by the bow). Actual drafts on 2/7/99 were 26'5" (26.42') forward and 20'2" (20.15') aft. 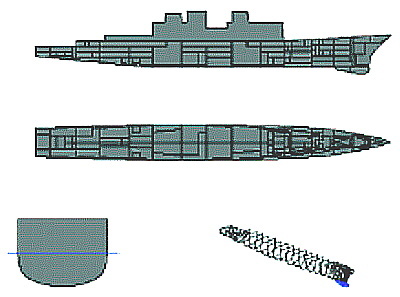 The ship maintained sufficient transverse stability following damage (as indicated by the righting arm curve and a GM of 3.16'). Subsequent evaluation of the righting arm curve indicated that the stability met underway wind heel and roll criteria of DDS079-1. Structural damage from the stem of the Saudi vessel consisted of complete penetration of the side shell and main deck from the 1st platform deck (24'above baseline) on the side shell to the ship 's centerline on the strength (01) deck, with damage extending mainly from frames 52 through 84.Additional structural damage from the bulbous bow of the Saudi vessel consisted of complete penetration of the side and bottom shell from the 2nd platform deck (15' above baseline) to the center vertical keel at the baseline, with damage extending mainly from frames 64 through 82.Outside these primary penetration areas, there was significant buckling of decks and tripping of stiffeners caused by the transverse force of the collision. Thus, many of the structural members outside the primary penetration area provided reduced effective strength to the hull girder. With the significant structural damage experienced by the RADFORD during the collision, the ship 's hull girder strength was seriously impaired in way of the damaged section. POSSE was utilized to provide evaluation of the residual hull girder strength for the damaged condition. Based upon structural surveys, damage was applied to structural elements in the damaged section for purposes of calculation of section modulii and shear areas. For structural elements deemed completely ineffective, the elements were removed from section modulii and shear area calculations. For structural elements deemed only partially effective (i.e. due to partial buckling of plating and/or tripping of stiffeners), the elements 'effectiveness was reduced by applying a "corrosion "factor, reducing the contribution of the elements to the section modulii and shear area calculations. The damaged section (e.g. at frame 69) was calculated to have lost up to 60%of it 's original section modulii (to both keel and deck) and approximately 35%of it 's shear area about it's horizontal neutral axis (i.e. for vertical bending and shear). POSSE calculated bending and shear stresses in way of the damaged section. Maximum stresses were under 30 ksi compression at the keel and 15 ksi tension at the strength (01) deck for bending, and under 5 ksi for shear for all potential damaged load cases envisioned. As the hull structure is primarily HTS (High Tensile Strength) steel, with a nominal yield strength of approximately 51 ksi, there was a factor of safety of less than 1.8 to yield in the extreme elements of the keel (compressive yielding). It should be noted that POSSE utilizes prismatic beam theory in evaluation of hull girder stresses. Thus, bending stresses are assumed to vary linearly across the section, with maximums at the extreme elements (keel and deck). Actual stresses do not vary linearly due to non-linear phenomenon of shear flow and shear lag. However, for purposes of evaluating risk of hull girder failure, experience has shown that this approach is reasonably accurate, provided non-linearities are considered and suitable factors of safety to hull girder failure are provided for. In order to increase the factor of safety to yield in the damaged structural section, additional stiffening members were fabricated and welded to the hull. Three large (36"T) beams were welded to the strength (01) deck, and one large (36"T) beam was welded to the starboard side shell at the main deck level. These stiffening members had the net effect of increasing the section moduli of the damaged section by approximately 10-15% thus reducing maximum bending stresses by 9-14% in the damaged section. Most combatant ship structures are designed and built with sufficient stiffness such that hull girder yield is the initial or limiting mode of structural failure within the hull girder. However, with the extensive damage experienced by the RADFORD, other modes of hull girder failure may have become limiting at or near the damaged section at frame 69 and needed to be considered. For example, with unsupported stiffened panels near the keel (due to loss of adjacent supporting structure), panels may first fail by buckling, or stiffeners may first fail by tripping. This is important because those elements near the keel were under high compressive stresses. A new feature available with the Windows version of POSSE (still in Beta testing) will be a capability to evaluate hull girder ultimate strength utilizing the U.S. Navy 's computer program Ultimate Strength (ULSTR) as a peripheral application (i.e. run from within POSSE). ULSTR performs a "limit state "analysis, and evaluates the ultimate hull girder strength by calculating bending moment necessary to yield, buckle or trip structural elements in sequence. Elements also shed load following initial failure, and thus adjacent elements must pick up the load shed by the failed adjacent elements. This can lead to a sequenced collapse of a hull girder, which may take place at or below bending moment levels which first cause yield in the extreme elements. 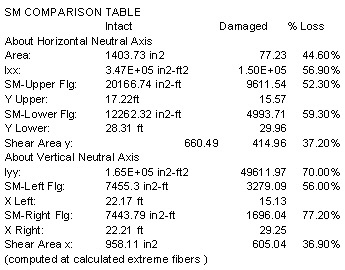 ULSTR was run within POSSE for the evaluation of the ultimate bending moment capacity of the damaged section at frame 69.Results of this analysis estimated that the damaged section had lost up to 55%of it 's original moment carrying capacity (with a factor of safety of less than 1.7 to hull girder collapse). Additionally, the "limit state "analysis indicated that initial failure mechanisms were associated with tripping of stiffeners and buckling of "beam-column "elements (stiffened panel elements), initiating at bending moment levels as low as 22,000 ft-Ltons. The maximum calculated vertical bending moment in any damaged load case envisioned was approximately 15,000 ft-Ltons. Thus, factor of safety to initial hull girder element compressive failure was calculated to be less than 1.5. Removal of all of the nearly 300 Ltons of ordnance onboard. Much of this ordnance was located in the forward magazines, which were flooded, and was the goal of the early weight removal for reasons of ordnance safety. Removal of anchors and chain. 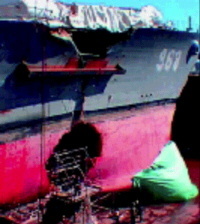 Removal of weight forward of the damaged section (frame 69) was desirable in order to reduce bending moment across the damaged section, in addition to reducing trim by the bow and draft forward. The only removable weights that met this goal were the anchors and chain. Removal of the forward gun mount. With the gun mount dislodged as a result of the collision, it was believed to be easily removable, providing a good trimming effect. Removal (lightering) of fuel oil (and compensating water) from the forward compensated fuel bank. This was the only large weight that could be removed, without resorting to significant underwater work to repair the major damage to the flooded compartments. Note: Removal of fuel oil from the forward fuel bank required installation and satisfactory watertight integrity testing of blanks on the 10"sluice lines between tanks 6-58-1/2-F and 6-94-1/2-F (port and starboard). If this could not be accomplished successfully, removal of the fuel from this forward fuel bank would not have been possible. As a backup, the alternate plan included dewatering of the sonar dome using ship 's service compressed air and addition of drydock weights (pier blocks) on the fantail to even out the trim. However, the alternate would not include as much draft margin for entering drydock. With successful lightering, it was calculated that the vessel would obtain drafts of 20.88 forward and 21.21'aft for entering drydock. Stability would remain acceptable, even as lightering of the fuel/water from the forward compensated fuel bank was accomplished prior to ordnance removal. Minimum expected GM was calculated to be 2.3 feet. The righting arm curve was evaluated to meet underway wind heel and roll stability criteria of DDS079-1.Additionally, maximum hull girder bending stresses in the damaged section would be reduced to less than 25 ksi (compression at the keel). Following removal of ordnance, it was discovered that predicted trimming effects were not obtained. It was subsequently concluded that the ordnance weight and location information provided with the loading condition information was apparently inaccurate. However, despite this shortcoming, acceptable fore and aft drafts for entering drydock were obtained, providing a 2'clearance over the sill. Per request of Norfolk Naval Shipyard Naval Architects, POSSE was utilized to model the USS RADFORD in drydock. The "Multiple Point Grounding "(MPG) feature in POSSE was used to model drydock blocks (keel and side blocks), and evaluate effects of pumping down the drydock on individual block loading, as well as on hull girder stresses. 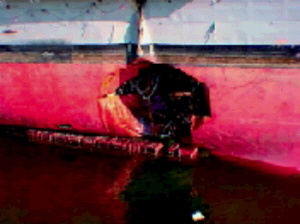 Note that all damaged compartments drain into the drydock as the dock is "pumped down ",as they are open to "free-flood". Additionally, the sonar dome would be dewatered during or shortly following drydock dewatering. Drydock blocking modeled using POSSE's "Multiple Point Grounding" capability. The drydock block buildup was modeled by 88 individual "grounding points ", at specified locations of the individual drydock blocks. POSSE rigorously calculated reaction force on each of the individual blocks required to satisfy force equilibrium. For the initial case where the drydock is pumped down, but the sonar dome remains full, individual block loads (in Ltons) were calculated to range from 194 ltons (on the aft keel block) to 21 ltons (on the forward keel block). It should be noted that this approach assumes that the ship is represented by a rigid body, with the given shape, weight and center of gravity. Thus, the block loading distribution is calculated based upon the ship 's geometry (offsets), center of gravity, and block distribution (locations). The hull was assumed NOT to deflect due to the drydocking (i.e. "hull deflection "was set to the default "no deflection of hull girder " in the "options "menu in Salvage Response). One alternative under POSSE 2.2 is to allow POSSE to calculate hull deflections based upon hull girder structural strength and longitudinal bending moment, or "inertias ". However, this approach requires a complex numerical iteration for the program to converge on a solution for both ground reaction at the 88 grounding points, plus the hull girder deflections. This multiple iteration scheme is numerically complex and does not converge easily. In fact, in this configuration, convergence could not be obtained with "hull deflection " set to "computed deflection based on hull girder inertias", unless the number of grounding points (i.e. drydock blocks) was reduced to a small number (less than 10 in this case) and the "spring stiffness "was significantly reduced to soften the force/compression curve on each block. Dewater the sonar dome prior to emptying the drydock or dewatering the sonar dome during the drydock dewatering process, but prior to the drydock becoming empty. This provides reduced bending moments at the damaged section. Bending stress at the damage section with the sonar dome dewatered were calculated to be reduced to approximately 33 ksi at the keel (compression) and 19 ksi at the strength deck (tension). Add drydock blocking under the sonar dome foundation (bellyband), thus reducing bending moments across the damaged section. In order for this to achieve much effect on reducing bending moments and stresses, the blocking under the sonar dome would need to have sufficient height to ensure they are sufficiently loaded to reduce bending moments across the damaged section. For example, where blocks under the sonar dome are set �"above the height contour of the sonar dome, bending stresses across the damaged section could be reduced to 18 ksi at the keel (compression) and 11 ksi at the strength deck (tension), providing an acceptable factor of safety to yield. For the drydocking, Norfolk Naval Shipyard included drydock blocking under the bellyband of the sonar dome. This blocking was set to the sonar dome offset heights, providing sufficient loading of the blocking, since the bow/sonar dome had dropped approximately 1"due to relaxation of the structure since the collision. Per request of Norfolk Naval Shipyard naval architects, POSSE was utilized to model and evaluate the afloat condition of the USS Radford with the bow section (forward of frame 94) removed. This was done to determine viability of a plan to move the ship to another drydock for installation of a replacement bow section. The modified POSSE ship data files were developed by deleting hull stations and compartments forward of frame 94,and adjusting weights (lightship weight distribution and variable loads) by removing components forward of frame 94. It was assumed (for the initial evaluation) that all tankage and other variable loads remained the same as for the initial drydocking condition. In this case, the stern section should float with approximate drafts of 15.7' forward and 24.0' aft. It should be noted that this forward draft is referenced to the new "bow "of this stern section (i.e. frame 94), vice the original forward perpendicular of the DD968. Stability of this stern section in this condition would be excellent, with a predicted GM of 3.78' and large righting arms throughout a large range of stability. While this initial analysis was completed using the initial (drydocked) loading condition, it is clear that some variation of loading would be required for the ship to float at a more suitable (even) trim for undocking. As this POSSE model was CONFIDENTIAL, conduct of the POSSE evaluation was inconvenient, although not problematic. Files required storage on a single 3.5"floppy disc (1.44 MB),and occasionally salvage case files not absolutely mandatory required deletion to make sufficient room on the single floppy disc. It should be noted that POSSE models for larger ships (e.g. aircraft carriers, amphibious vessels, etc.) could be problematic since the models will not fit on a single 1.44 MB floppy disc. It is recommended that users who anticipate use of larger CONFINDENTIAL POSSE models consider acquisition of a Zip Drive (100-200 MB), vice requiring their hard drives be made CONFIDENTIAL in an emergency.